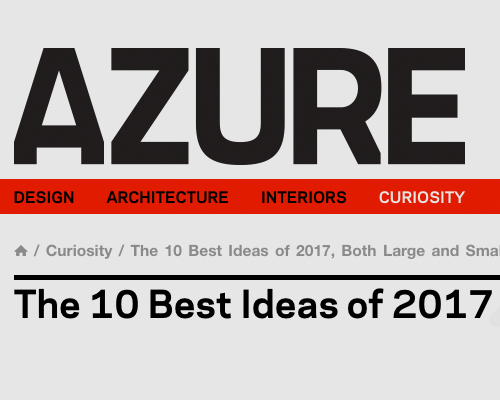 Here are the 10 best ideas of 2017 that have made a profound impact, both large and small. Paint has come a long way. What used to be a toxic concoction is now eco-friendly with low-VOC that won’t harm lungs. The U.K.’s Graphenstone raised the bar even further this year with paint that can also help purify the air. The buzz around graphene has been escalating since the material was first isolated as a single atom in 2004, by scientists Andre Geim and Konstantin Novoselv at the University of Manchester. Today, its unparalleled characteristics are well documented – thinner than a single strand of human hair, 200 times stronger than steel but super flexible, more conducive than copper and proven to be a supremely efficient thermal conductor. In 2013, chemical engineer and founder of Graphenstone Antonio León Jiménez began working the material in with his artisanal lime-based paints and coatings. The result was an innovative product that boasts multiple benefits for the industry. The collection now encompasses both interior and exterior applications that, besides purifying the air, can absorb CO2. It is also mould-, fungus- and bacteria-resistant. Why we like it: Graphenstone has turned an everyday product into one that is healthy for us, our buildings and the environment. With the population of refugees and asylum seekers reaching tens of millions, there is no denying that the need for food, healthcare and shelter has reached a critical level. Along with these basic fundamentals is the need for reliable and secure information that can provide refugees with such essential details as what country they are in, and where their families are. That’s where Refugee Text, a not-for-profit tech start-up, comes in. Founded by Ciarárn Duffy, Caroline Arvidsson and Kåre M.S. Solvåg, the organization uses basic SMS data sharing to provide users with vital information, such as informing refugees of their basic rights, and enabling them to access services they need. Information is provided in English and Arabic (with plans to add Farsi and Dari) by a network of verified NGOs and other humanitarian groups. And information is updated regularly. Because SMS does not require a wifi signal, Refugee Text is available anywhere, regardless of data plans. Currently available in Germany, Denmark and Sweden, the service is slated to expand through Europe in the coming year. Why we like it: Proof that today’s technology can provide humanitarian good and potentially save lives. If there was ever a year to launch a personal panic button, it was 2017. Presented by Los Altos startup Nimb, this fashion-forward wearable tech conceals a tiny alert trigger on the inside of a chunky bauble. Unlike a phone, the ring is always in hand and a call for help can be sent out silently and secretly. Just hold the button on the inside of the band for three seconds to alert pre-programmed contacts, such as friends, family, or the police, of your location via the app. Information such as where the wearer is going, who they are with, and what they are wearing, can all be logged in and a “follow me” feature can call for help if the wearer deviates from a pre-determined route. Why we like it: Made to enhance personal safety and encourage a sense of security, the ring is a solution for so many at-risk situations, including online dating, nighttime runners, people with health issues or disabilities, even employees at small retail businesses who may be working alone. Anyone who lives or works in a skyscraper knows how much time is spent waiting for a lift. This year, the German elevator company Thyssenkrupp unveiled a remarkable solution for the waiting game: a rope-free elevator system that moves cabins vertically as well as horizontally. The network operates somewhat like rail line switching tracks in order to keep the system in continual motion. Called Multi, the cabins move along tracks that have “exchange systems” to allow for 90-degree turning. That means the cabin can switch from one direction to the another, continually moving along the tracks like a sliding puzzle. When an elevator cabin is needed it can zip along the fastest route, circumventing any congestion points. Now, imagine what this up-and-down and side-to-side transportation network might mean for the shape of buildings. The scale and form of a tower would no longer be restricted by its footprint size. A few elevator shafts could service hundreds of riders swiftly and efficiently, and towers could be joined by elevator bridges in the sky. Thyssenkrupp estimates Multi has the potential to increase elevator travel capacity by upwards of 50 per cent, and reduce waiting time by as much as 60. Why we like it: There is nothing like seeing a futuristic idea become reality. Thyssenkrupp first unveiled its sideways elevator back in 2014, but in July of this year, it reached a pivotal benchmark with a fully realized test version installed in a tower in Germany. This year saw a plethora of smart architectural interventions located in unexpected places, including an office under a bridge, and three underground museums; one by BIG, the others by Snøhetta and Renzo Piano Building Workshop. In Copenhagen, local firm Arcgency added yet another remarkable space located inside a construction crane in the city’s harbourfront district. Though cranes are a familiar fixture in redeveloping areas such as Nordhavn, this one predates the area’s revitalization and was once used to load coal onto ships, rather than to build towers. The industrial equipment has found new life with the addition of three spaces that host a spa, a 20-seat meeting room, and, in the uppermost reaches, a private retreat for two. Paying tribute to the structure’s “dark past,” Arcgency’s interiors pair the clean lines of classic Danish design with a monochromatic palette of soot black leather, stone, steel and wood. Why we like it: The glass-walled meeting room offers panoramic views of the sea, sky and city that beg the question: why didn’t anyone think of this sooner? In 1967’s The Graduate, young Benjamin Braddock is famously given the “one word” key to success: plastics. Today, he might be advised to go another route: silk. From clothing and beauty products to consumer packaging, the petrochemicals commonly used to stabilize or preserve what we wear, put on our bodies and store food and drink in are gradually being supplanted by the material generated by silkworms, especially in liquid form. On the cutting edge of this phenomenon is the U.S. company Silk Therapeutics, which aims to replace the micro- and nano-plastics in many skin-care products, shampoos and deodorants with a “liquid silk” made with proteins extracted from discarded cocoons. Unlike petrochemicals, liquid silk doesn’t contribute to climate pollution when it’s created and won’t contaminate rivers and lakes when washed down drains. Because it’s a natural byproduct, it’s easier for the body to absorb. And unlike silk used for clothing, which is often made by boiling the cocoons to extract the fibre, liquid silk is sourced from discarded (lesser grade) casings, so the silkworm doesn’t die. One word: brilliant. Why we like it: Major health and environmental benefits aside, liquid silk is one of those rare fossil fuel alternatives, like solar panels and wind power generators, with real commercial potential, especially if, as planned, it’s also used to make performance clothing, water bottles and can linings. The idea of geo-engineered cooling is nothing new. In fact, back in 2011, Gwynne Dyer (the Canadian journalist who wrote Climate Wars) had suggested that creating seawater clouds, filling the atmosphere with sulfur dioxide, and painting urban surfaces white could manipulate climate change. Six years on, one of those ideas has taken hold. CoolSeal is a water-based, asphalt emulsion coating that’s already having a dramatic effect in Los Angeles. The “urban heat island effect” is a term used to describe cities that are warmer than their surrounding areas due to an over abundance of heat-concentrating building materials and a lack of vegetation. L.A. is one such city that has felt the impact of UHI and this year it took action by applying CoolSeal, a reflective grey coating, to selected streets in 14 of its 15 council districts. It’s still a pilot project, but the results are already promising. According to The Washington Post, CoolSeal-coated parking lots are 5.5 degrees celsius cooler. Manufacturer Guardtop says the material boasts 33 per cent reflectivity, and, under the right conditions, the coating can swing temperatures by as much as 16 degrees. Why we like it: A low-tech solution to a complex problem is always appealing. It also brings relief to vulnerable people who can’t afford air conditioning. At $7,000 for every 1.6km, the technology isn’t exactly cheap – but if it scales up properly, CoolSeal, or technologies like it, could be a simple solution for cities scorched by climate change. Transportation is a fundamental social good, but building forward-thinking public transportation systems is complex – especially since cities are becoming an increasingly tangled network of public transit, bike shares, short-term car rentals and ride-sharing services. That’s where Mobility as a Service steps in. Rightly hailed as “the Netflix of public transit,” MaaS is a public-private partnership that combines multiple modes of transport into a single service. Controlled through an app called Whim, which allows users to pre-pay for trips or subscribe for a monthly fee, MaaS allows travellers to plan trips based on their needs, using trains, buses, ride-sharing services or bike rentals. It’s remarkably flexible and user-friendly, which has driven early positive results. Helsinki, for instance, launched a MaaS pilot project in October, and saw a 25 per cent increase in mass transit usage. Why we like it: It’s a completely different way to think about transit. The real goal is to encourage users to ditch private cars by making other (greener) options irresistible by being cheaper, more convenient, and more flexible. It’s prompted aggressive transportation goals in Helsinki, too: the Finnish city hopes to go car-free by 2025 and carbon neutral by 2050. Until the Dot Watch was released this year, timepieces for the blind involved crystals that could flip up, allowing the wearer to feel the hands. Fiddling with a watch’s hands, however, is a good way to damage the works. The Dot Watch, by contrast, uses a time-tested system – braille – to not only communicate hours and minutes, but also provide notifications. Developed in Korea, Dot is powered by a rechargeable battery and boasts standard smartphone features, including a touch sensor, a vibration motor and Bluetooth. The innovations that makes it revolutionary are the four motorized modules, each with six possible dots, housed underneath a protective concave dial. Each of the dots can be raised or lowered individually, enabling the display of up to four braille characters (which the wearer reads as if they were printed on paper) at a time. And it’s as good-looking as it is innovative, featuring a big yet lightweight aluminum case and three leather straps of varying sizes. Why we like it: The combination of technology and a tactile system long used by the blind make this timepiece a real breakthrough for the visually impaired. No other geek news story grabbed headlines quite like Sophia, the world’s first social humanoid robot to gain citizenship, in Saudi Arabia. Sophia is a bit like Lucy, the cloned sheep: she is the test case for all that can potentially go right – and terribly wrong – when humans try to imitate nature’s own. The work of David Hanson of Hanson Robotics, Sophia represents the conundrum of our future existence, when machines develop the potential to overcome their inventors. Elon Musk, for one, has said AI is a “fundamental risk to the existence of human civilization.” Stephen Hawkings has also described it as the “worst event in the history of our civilization,” unless society finds a way to control its development. Those well-informed views test our understanding of what’s at stake when pursuing the outer reaches of technology. Interestingly, Sophia also brought to light more immediate realities, especially the fact that her Saudi citizenship would not have been possible if she were human. She announced her new citizenship to the media while not wearing a hijab, nor was she unaccompanied by a male guardian: two fundamentals that are forbidden for Saudi women, by law. Just where machines and humans are different took one giant step closer together. Why we like it: Sophia may be the lighting rod needed to find clarity on how to think, use and regulate AI in the coming years, to ensure robotics make the the world a better place.